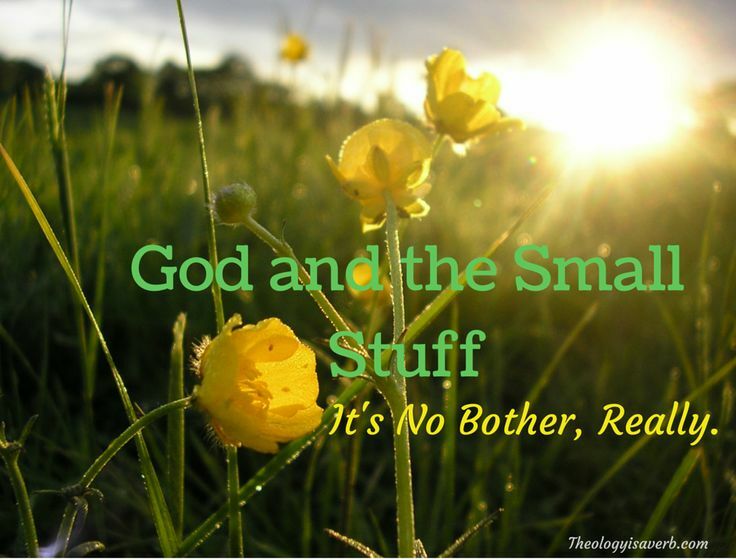 God and the Small Stuff: It’s No Bother, Really. It’s Monday morning and I have reluctantly left the warm comfort of my bed to embrace the day and week ahead of me. Why reluctantly? It wasn’t as if I had failed to enjoy the weekend, or conversely had enjoyed it so much as to need the added rest. Yet, whatever the reason I needed help, indeed strength to rise and greet the sunrise as it would soon be greeting me. So, I prayed. As morning routines have ensued, and I have found space and time for reflection, I am reminded again of God’s constant and faithful promise to always walk beside us. Growing up, I watched both my mother and grandmother go to God throughout their day with the great and small stuff of life. For my grandmother, this time was spent with daily scripture, and silent prayer. If she didn’t know the answer she knew who did and went straight to the source. My mom, though less attentive to scripture reading, found also great humility in her immense dependence on God. With petition and praise she thanked God for the food on the table, the roof over our head and gift of one another each day. Yet, she likewise would pray for good news to arrive, the sun to shine, the rain to stop, peace to come or the strength to endure the day ahead. With a beautiful gleam in her eye, I was invited to listen to her retelling of the story of working the family’s fields alongside her brothers and sister. As the sun would beat down relentlessly in the heat of the day, exhausted and worn, they would sing and lift up this prayer for rain. Oh, Let “there be showers of blessing..
Our Father wants to be our friend all along- not just when we are in dire trouble. Today, let’s invite God into our day, into the little things of life..He’s here waiting for us to bid him near. Father you come to me whenever I call! I know you smile to see me reach for you. And like a loving dad you hold out your arms to guide, encourage and catch me when I stumble. You know how difficult those first steps can be each day, and though our strength may fail..Yours always remains! Previous postWorth Revisiting: Why Pray the Stations of the Cross?